1. Preheat the oven to 200ºC, gas mark 6. Place the peppers, aubergine, courgette, red onion and garlic in a large roasting tin. Drizzle over the olive oil, scatter with rosemary and toss together, then roast in the oven for 20 minutes. 2. 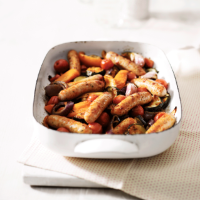 Stir in the cherry tomatoes then sit the sausages on top. Return to the oven for 15 minutes. 3. Stir together the sundried tomato paste and stock, and pour into the tin. Increase the oven temperature to 220ºC, gas mark 7. Return the ratatouille to the oven for a further 10 minutes until the vegetables are tender and the sausages are nicely browned and completely cooked through with no pink meat. Divide between bowls and serve with crusty bread. For a spicy flavour, try adding chunks of chorizo to the recipe with the ingredients in step 2.